I couldn’t resist the pun and the opportunity to try the brand everyone from Sephora to every magazine and blog has been raving about! I’m in love with the pretty pastel packaging, but my favorite thing about this line are the active formulas and real results. One of the first natural brands to go truly mainstream Drunk Elephant offers clean, effective products with a tongue in cheek approach. New T.L.C Sukari Babyfacial, a professional strength 25% AHA (glycolic, tartaric, lactic, citric) + 2% BHA (salicylic) weekly resurfacing treatment with brightening chickpea powder and antioxidant matcha tea, apple fruit and milk thistle it stripes away dead skin cells and debris to reveal baby soft skin! You definitely get a tingle for the first few minutes but no redness or irritation that can often follow traditional peels. 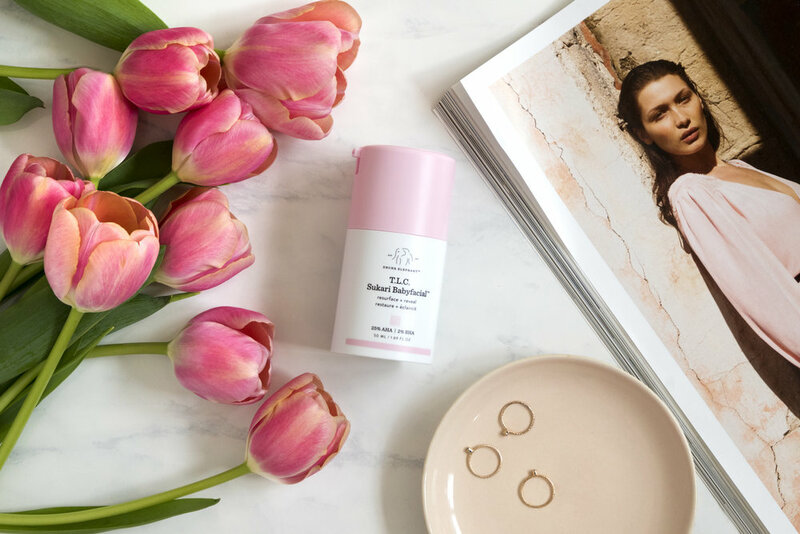 I follow it with the Lala Retro™ Whipped Cream - a product that may as well have been made for my skin – it delivers long-lasting ultra-gentle lightweight cream it soothes and firms skin with 6 African oils, Plantain extract and fermented green tea. It’s like the cold cream our mothers and grandmothers used reinterpreted with modern technology and a globally-sourced ingredients. Next up the Shaba Complex™ Eye Serum! I have to confess I am deeply unimpressed with most eye creams I try but this one was a refreshing change from that trend! The texture is soft and silky but the formula packs a big punch – yucky sounding but highly effective black tea ferment + copper peptides firm the eye area while their propriety Shaba Complex (edelweiss stem cells + niacinamide) smoothes wrinkles and brightens dark under eye circles. They’ve also brought in one of my favorite ingredients Co-Q10, used in many fantastic green beauty products, that works to ward off environmental aggressors that damage the sensitive skin around the eyes that leads to skin damage and aging. My favorite of the bunch - T.L.C. Framboos Glycolic Night Serum, a 12% AHA gel/serum that when used overnight brightens, evens and clears the skin. 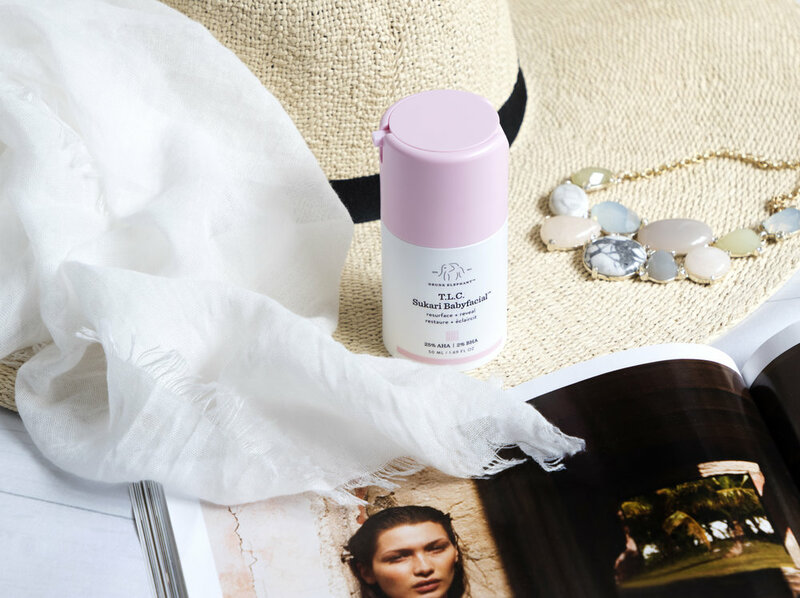 Horse chestnut and white tea prevents skin irritation while their dream team blend of AHAs - TLC (tartaric, lactic, citric acids) plus raspberry extract loosens the “glue” that holds dead skin cells to the surface. I saw a huge difference in my skin after using this for a few weeks and this is definitely a product that will stay in my nightly regimen. And I can’t forget the adorable Lippe! It’s a super-cute and lux lip balm that makes me smile every time I pull it out of my bag. Rich Avocado, Mongongo, Cranberry and Marula Oils nourishing the lips while peptides and sea fern algae boost collagen. A just in time for summer it contains Green Tea Leaf and Vitamin C that repair damage caused by too much exposure to UV rays. I also tried sample of the brand’s signature Virgin Marula Luxury Facial Oil and it was just as amazing as I’d heard it was!